Maxi-Grow organic tomato fertilizer is a yield increasing liquid organic fertilizer formulated with high grade macro and micro nutrients, cytokinins, Gibberellins, amino acids, humic acid, fulvic acid, enzymes, proteins, vitamins and minerals. Maxi-Grow organic tomato fertilizer offers numerous advantages in many different growing mediums. It conserves energy in plants, improves photosynthetic efficiency, aids in biological nitrogen fixation and solubilization of soil minerals, suppresses plant pathogenic organisms and replenishes and maintains long-term soil fertility by providing optimal conditions for soil biological activity. 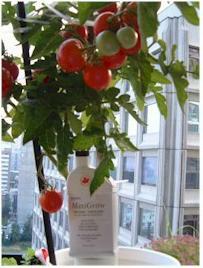 Maxi-Grow tomato fertilizer can promote plant growth, even when the plant is under nutrient stress. Maxi-Grow tomato fertilizer contains substances that can open up pathways in plants that allow them to extract more moisture from soil during drought conditions. Similarly, research showed that plants, fed with Maxi-Grow, can withstand up to three degrees of frost. Improve the growth of beneficial soil bacteria. Eliminate the need for chemical fertilizers. Dilute 3 oz. CB-QGG Seed Treatment in 1 quart. of water. Soak tomato seeds in the diluted solution for 3 to 5 minutes. Plant 4 seeds together at a depth of 0.25 in. When plants are 1 inch in height, transplant to individual pots or thin to 3 inches apart. Dilute Maxi-Grow at a rate of 1 oz. / 5 gal. water and apply at 7 day intervals. Start tomatoes from seed indoors - transplanted outside when night time temperatures reach and remain above 60 F.
For late tomato crops, seeds can be planted outdoors when night time temperatures reach and remain above 60 F.
In frost-free regions, tomato seeds can be planted outdoors in early fall for harvest in winter and spring. Tomatoes are sensitive to cold and changing moisture conditions, mulch plants with hay, straw or old grass clippings. For staked tomato plants, prune to one or two main stems when side stems reach 2 in. in length. Water tomatoes by soaking the ground around each plant - Avoid spraying foliage. Store in a cool place away from direct sunlight. No special handling required (See MSDS). Maxi Grow is produced in accordance with NOSB (National Organic Standards Board) guidelines. The materials used in the production process are derived from naturally occurring and sustainable sources and are consistent with organic principals and the National List of Allowed Substances. Maxi Grow does NOT contain synthetic chemicals, animal components, animal byproducts, manure or manure byproducts. Maxi Grow is environmentally safe and is not harmful to animals, plants and humans.